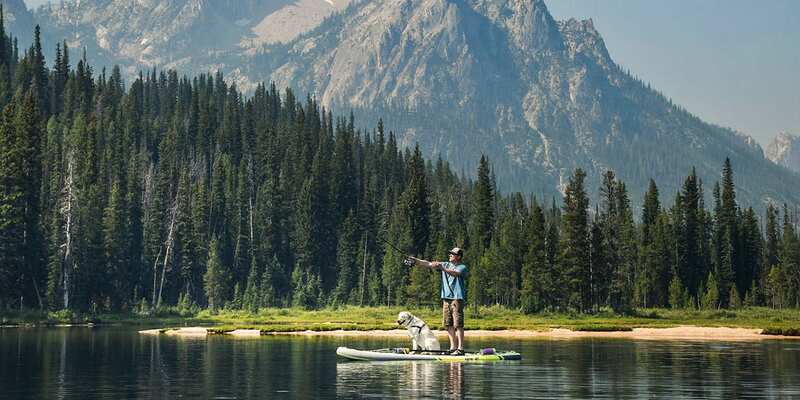 Inflatable stand up paddle boards are all the rage right now. Born in 2014, inflatable SUPs have become a staple in the stand up paddle board world. 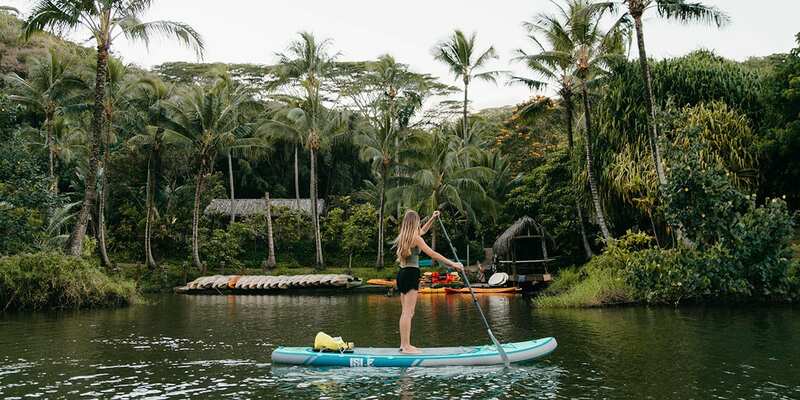 Many people are upgrading from traditional hard paddle boards (aka epoxy) to inflatables because of the several benefits they offer. Also, many people who have hard paddle boards are adding an inflatable SUP to their quiver to help fill in the gaps of what their epoxy SUP cannot provide. There is a big difference between inflatables and epoxy paddle boards, but they are both great options. Repeat after me. Inflatable SUP boards are not blow up toys. 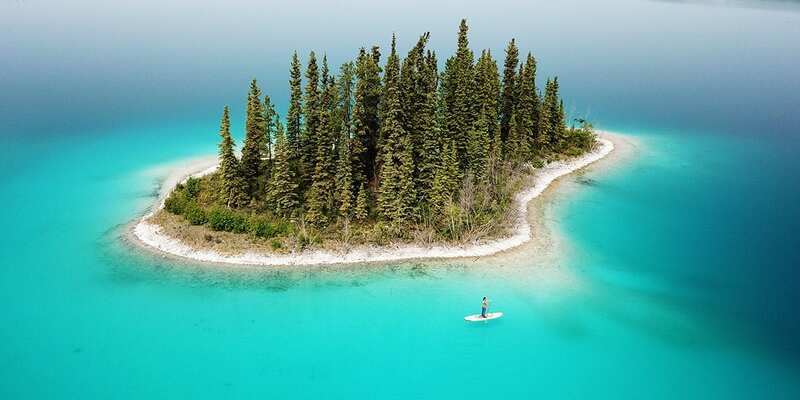 One of the biggest misconceptions about inflatable paddle boards is that they are not rigid, and in return, do not perform as well as a traditional epoxy stand-up paddle board. This is a myth! There are actually more than a few myths about inflatable SUPs that we debunked last year. Inflatable paddle boards are almost or just as rigid as epoxy paddle boards when pumped up to their suggested PSI. See what happened when we raced an inflatable vs an epoxy. It was a close call! Since 2014, the technology for inflatable paddle boards has improved tremendously and will continue to improve for the years to come. Today’s best inflatable boards are constructed with military grade, high-density PVC layers. This is what makes up the exterior of an inflatable stand up paddleboard. 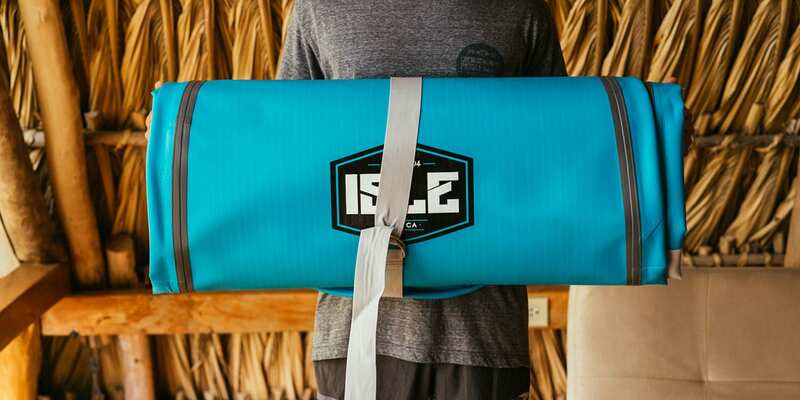 The inside of an inflatable is constructed with drop-stitch technology allowing the board to become super rigid when it’s inflated. You will find that most inflatable SUPs today are constructed with two layers of PVC instead of one, making them the most rigid they have ever been. Unfortunately, today’s market of inflatable stand up paddle boards is being flooded with low quality, cheap boards. Beware of these inflatable SUPs. Low-quality inflatable standup paddle boards have only a single layer of PVC and some are less than six inches thick. Inflatable boards that are less than six inches thick will be rigid enough until too much weight is put on them. Four-inch inflatable SUPs are becoming obsolete because they cannot hold a person’s weight efficiently. 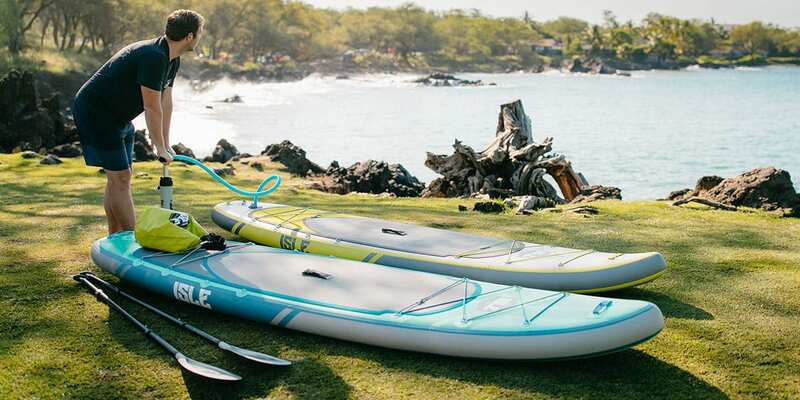 Rule of thumb: If an inflatable paddle board seems super cheap compared to others, make sure to learn more about the board’s construction, as you may find out that it lacks a high weight capacity and is a low-quality board. Ultimately, if an inflatable SUP is constructed poorly, it will not last long nor ride well. 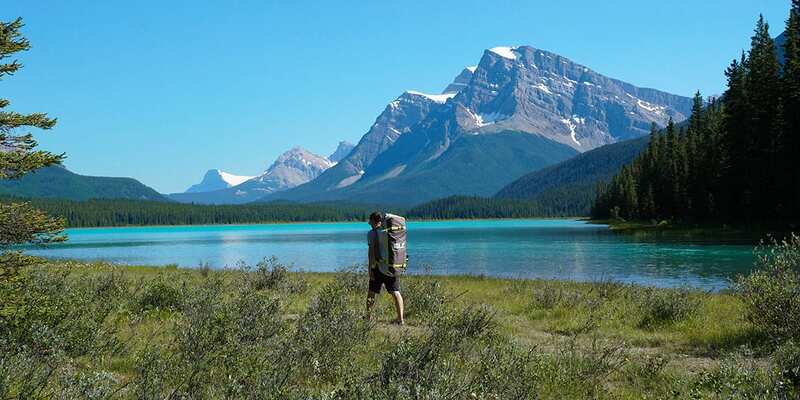 There are various benefits that make inflatable paddle boards so popular. Simply put, inflatable SUPs are easy to travel with, great for storing anywhere, and are super durable. Let’s discuss each of these topics in more detail. Inflatable paddle boards are great SUPs for those who are always on the go. If you love traveling to new places with your paddle board, transporting an inflatable SUP will be a lot easier than an epoxy paddle board. Once deflated, an Inflatable SUP rolls up to the size of a sleeping bag and fits in a carry backpack. If you want to go paddleboarding an hour away, all you must do is grab your bag and throw in your car’s trunk or back seat and you’re ready to roll. You completely avoid having to strap your SUP to your roof rack or trying to fit in your large truck or SUV (if you even own one). With an inflatable SUP, you can physically store it anywhere. You don’t need to clear out a large space in your garage, basement or house. As mentioned earlier, storing an inflatable paddle board in your car is simple because it’s the size of a backpack. Before you store your inflatable SUP, make sure to read our tips for storing your paddle board. By reading about the inflatable paddle boards construction earlier in this article, you are aware that today’s inflatable SUPs are super durable. If you were to drop your inflatable on the pavement, it would bounce back without a scratch. Hell, throw it off a building or run it over with a truck and it will still be standing strong. The high-quality inflatables are constructed with military-grade PVC and drop-stitch technology. These boards are lightweight, rigid, and very durable. Quality inflatable SUPs are meant to last for a long time, offering you a long life of stand up paddleboarding. There many different types of inflatable paddle boards. 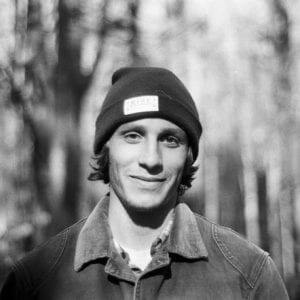 There are inflatables for fishing, yoga, touring, and, of course, recreational paddling. No matter what type of paddle sport you decide to do, inflatable paddle boards are versatile and can be used for various types of paddling. When browsing for an inflatable SUP, you will notice that some have a round nose while others have a pointed nose. The round nose inflatable paddle boards are great all-around shapes and the pointed nose boards are ideal for touring. Learn more about the difference of stand up paddle board shapes here. Pumping up an inflatable paddle board can be difficult at first, but after a few tries, you will become a pro. Like anything in life, practice makes perfect. Most inflatable SUP owners will inflate their board once they arrive at their paddle board destination because it’s much easier to transport it to and from your home when it’s deflated. Most first-timers and beginner level paddle boarders start out by inflating their boards with a hand pump, but soon graduate to an electric pump–as hand pumping your board can become quite tiring, but a good workout! Hand pumping an inflatable paddle board will take you about 10-15 minutes tops. Keep in mind, your inflatable SUP will only be super rigid if you pump it up to its suggested PSI. Most inflatables need to be pumped up to at least 12-15 PSI to feel rigid. Pumping up your inflatable to any PSI lower will affect your ability to stand on the board in the water and the overall performance of your ride. Inflatable stand up paddle boards are popular right now for a good reason. They are easy to travel with, store at home, super durable, and lightweight. If you travel often and want to take your SUP with you, have minimal storage space, or you want a SUP that will last you for the years to come, an inflatable SUP is right for you.